Lexicographer, philosopher, and poet; flourished at Granada in the second half of the fifteenth century. He exercised the function of dayyan at Granada and enjoyed a great reputation as Talmudist. When the Jews were banished from Spain, Saadia and his father, Maimun, settled at Oran, where they remained until their deaths (compare Neubauer, "Cat. Bodl. Hebr. MSS." No. 1492). Ibn Danan was the author of the following works: (1) "Al-Ḍaruri fi al-Lughah al-'Ibraniyyah" (The Necessary [Rule] of the Hebrew Language), a Hebrew grammar with a chapter on Hebrew prosody (this chapter, translated by the author into Hebrew at the request of his pupils not acquainted with Arabic, was published by A. Neubauer in his "Meleket ha-Shir," Frankfort, 1865); (2) a Hebrew dictionary in Arabic; (3) commentary on ch. liii. 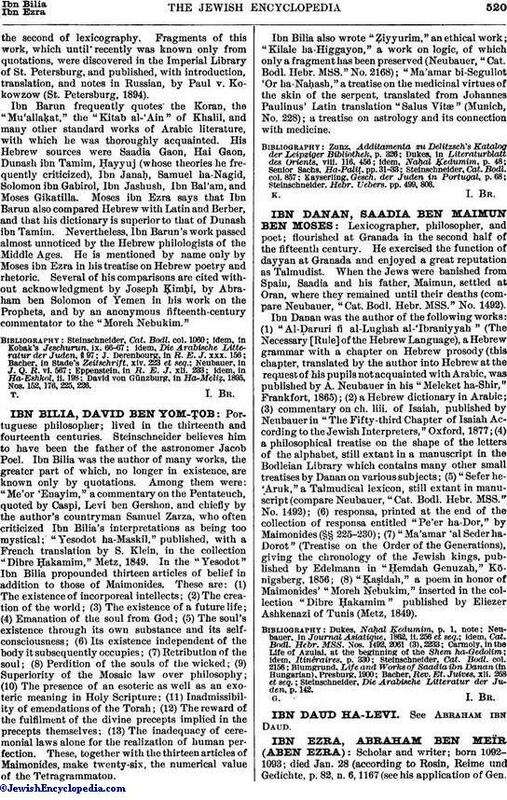 of Isaiah, published by Neubauer in "The Fifty-third Chapter of Isaiah According to the Jewish Interpreters," Oxford, 1877; (4) a philosophical treatise on the shape of the letters of the alphabet, still extant in a manuscript in the Bodleian Library which contains many other small treatises by Danan on various subjects; (5) "Sefer he-'Aruk," a Talmudical lexicon, still extant in manuscript (compare Neubauer, "Cat. Bodl. Hebr. MSS." No. 1492); (6) responsa, printed at the end of the collection of responsa entitled "Pe'er ha-Dor," by Maimonides (§§ 225-230); (7) "Ma'amar 'al Seder ha-Dorot" (Treatise on the Order of the Generations), giving the chronology of the Jewish kings, published by Edelmann in "Ḥemdah Genuzah," Königsberg, 1856; (8) "Ḳaṣidah," a poem in honor of Maimonides' "Moreh Nebukim," inserted in the collection "Dibre Ḥakamim" published by Eliezer Ashkenazi of Tunis (Metz, 1849). Steinschneider, Die Arabische Litteratur der Juden, p. 142.